Seriously, I was so charmed by this little motel. Sure, it’s tucked between a gas station and an “I’m not really sure I recall what that concrete block on the other side was”, yet still! When you walk in the front office door, you expect to be inside a building… but no! Instead, you are in a little, open-air courtyard, with a vintage motor court laid out around you. Ainsi charmant! The night manager was friendly, the room was reasonably clean, the shower pressure was intense; good value. 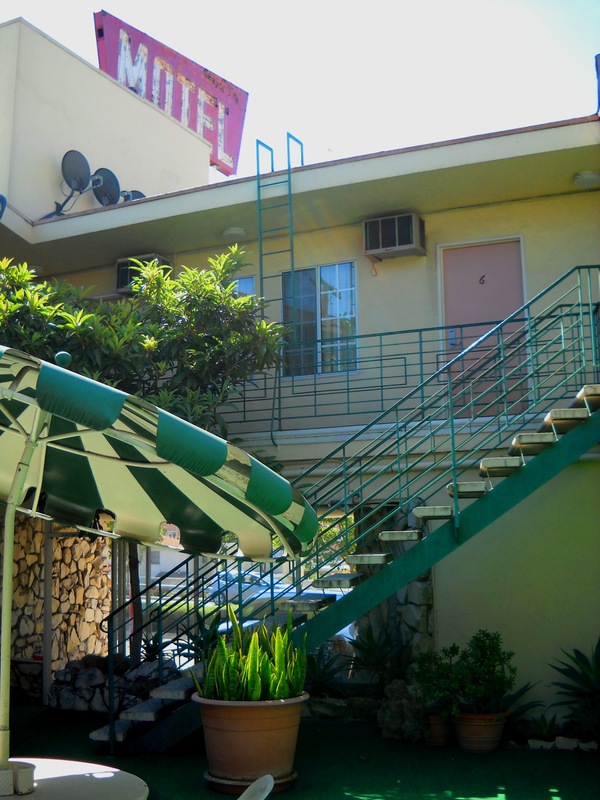 Googling this motel, all I was able to find was a blog entry from a traveling musician who stayed there with a friend. He tells an entertaining story involving strippers and stuffed animals. I could not, however, find any history of the motel or traveler reviews, either. Do you know, I am a traveler, and I would recommend this motel on Trip Advisor. In fact, I am going to do that right now, excuse me a moment if you would…. I’m back! Well, that was unfulfilling. 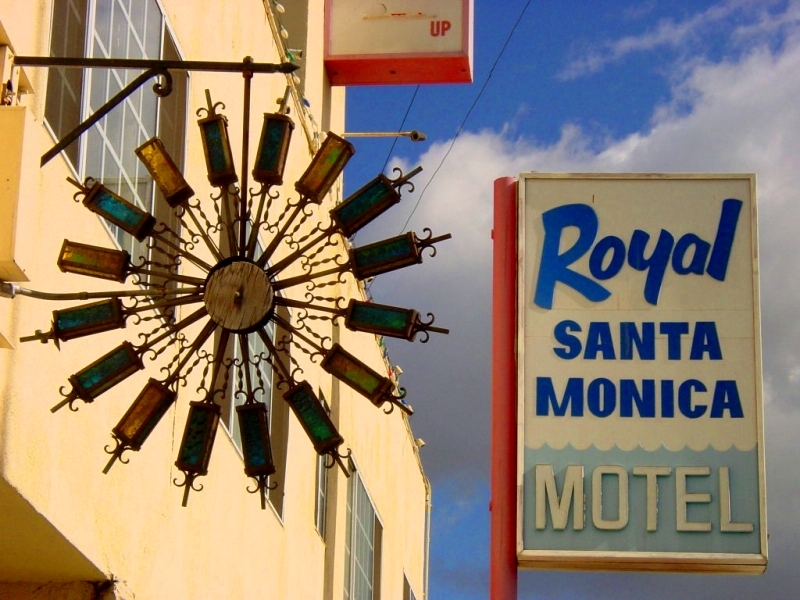 The motel has never been listed on Trip Advisor, thus it does not yet exist, and must be submitted for a reviewal of its actual existence before inclusion. In the meantime, a review of the hotel has popped up on Yelp since the last time I googled. It’s a bad review, and while it makes no mention of strippers or stuffed toys, it does go on a bit about bedbugs. We didn’t have an issue with bugs of any kind while there, thus I still recommend this motel. Besides, the human body is host every day to over 100 trillion microbes; why must people quibble over a cimicidae, or two? Try worrying about sleeping with scorpions in the desert; it gives you a whole new perspective. We woke up refreshed (and bedbug free) on the 6th day of our roadtrip. Since we’d gotten to sleep quite late the night before, we slept in until nearly 9am and had a later start to the day than had been typical for the trip so far. We took a moment to utilize the Wi-Fi (free!) in our room for a few bill-related items and we were off. 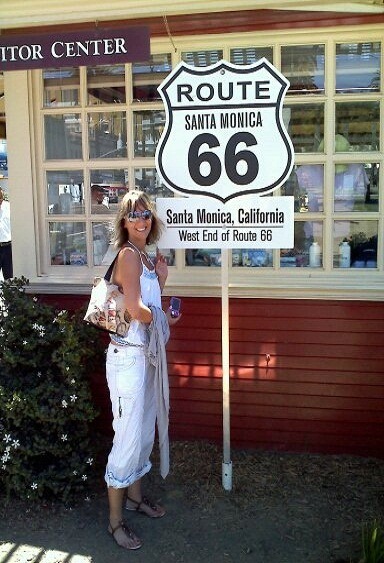 Gas station coffee was procured next door, and we drove west again down Santa Monica Blvd to the Will Rogers Highway Marker in Palisades Park. There was plenty of space available in the fee-parking lots of this area, so we paid for two hours of parking, and went off to explore. The official end of Route 66 is where it junctioned with 101 highway some ten blocks east of Palisades Park, and south of Ocean Avenue. 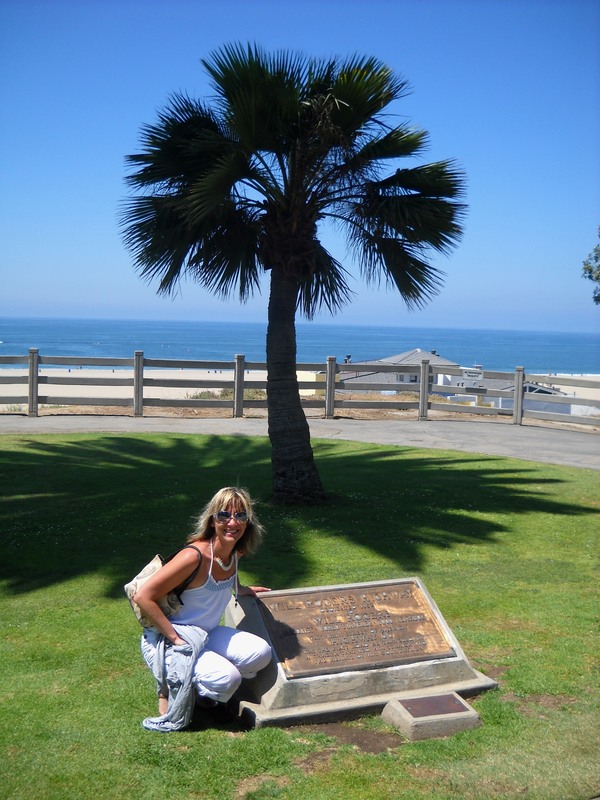 But the Will Rogers Highway plaque placed in Palisades Park in 1952 has become the "unofficial" western terminus of Route 66. Art Deco Beauty -The Georgian ~The Georgian Hotel first opened in the spring of 1933. 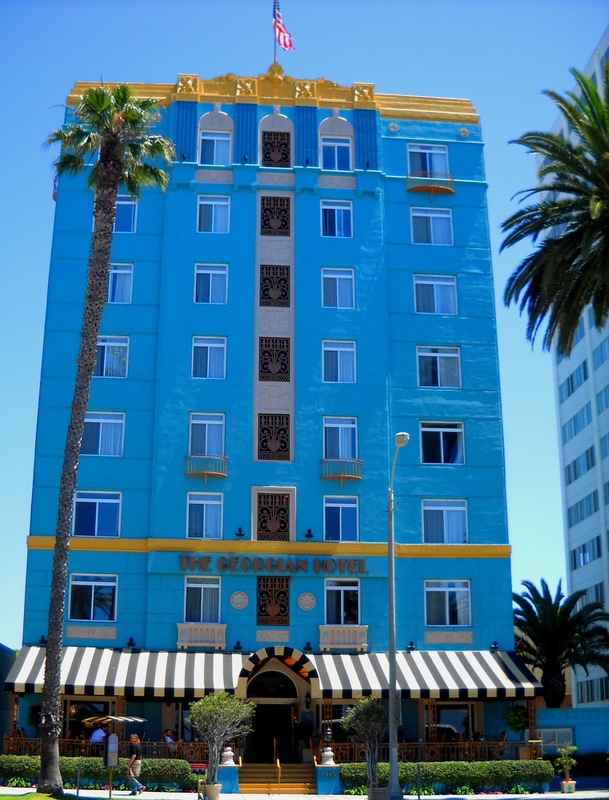 Built during the peak of California’s coastal expansion of the late ’20s and early ’30s, The Georgian Hotel's design showcased both the Romanesque Revival and Art Deco architectural styles. 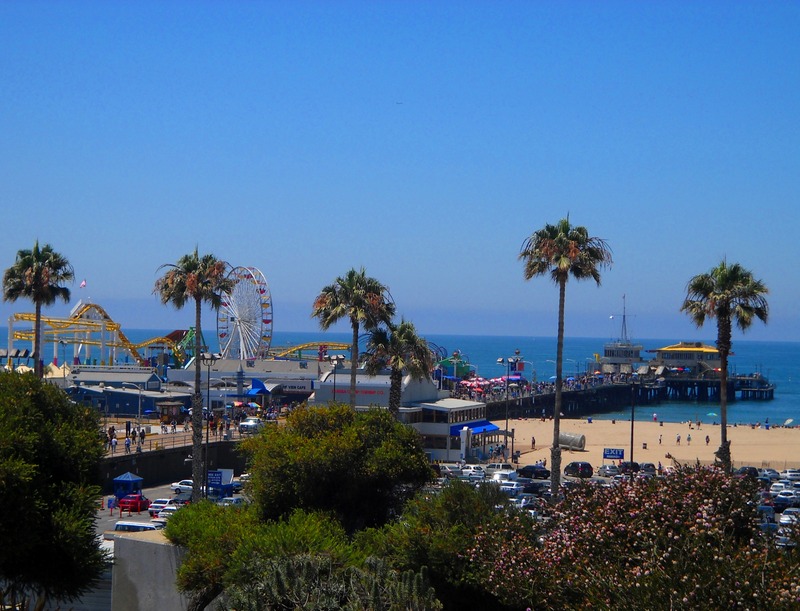 Originally, The Georgian was one of the first “skyscrapers” along a then sparsely populated Ocean Ave.
Of course, we couldn’t leave Santa Monica without first visiting the Santa Monica Pier, so after locating an espresso shop near the beach, we walked down to the pier that has delighted visitors for over 100 years. 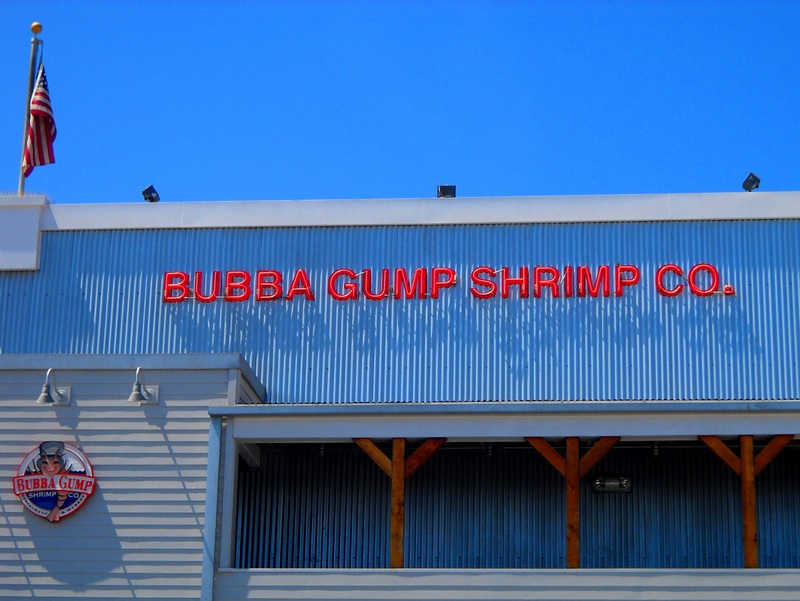 This is probably a chain or franchise on the west coast, but we have no such creature where I live, and it was my first visit. I had some sort of vanilla bean, pure honey, espresso laden, frappe type concoction, and it was one of the best coffee drinks I’ve ever had. You know those shampoo commercials where the lady’s shampoo is orgasmic? Well, that’s a lie, I’ve tried that shampoo and it’s not orgasmic at all. Not even a little tingly. But that latte? Was orgasmic. Anywho, we then proceeded to the Pier, the “End of the Trail” for the western portion of Route 66. 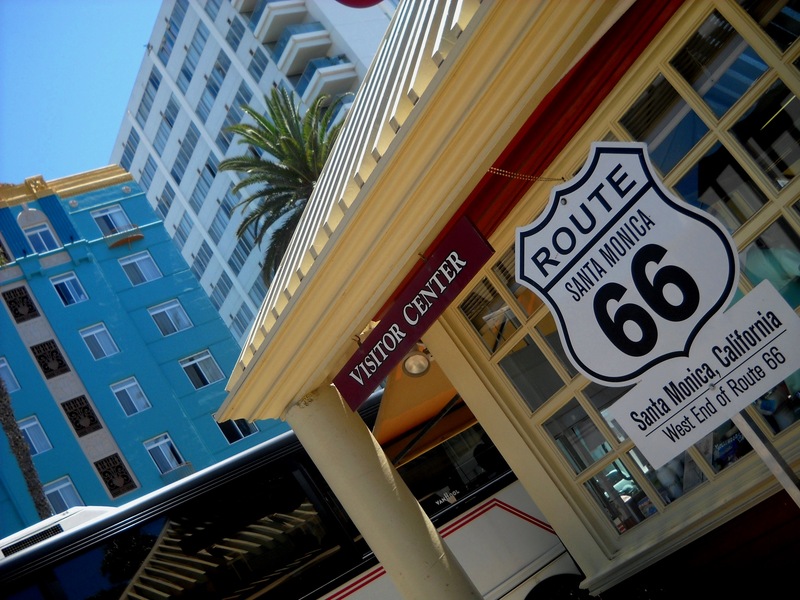 "On November 11, 2009, the 83rd birthday of Route 66, the Mother Road leapt into the future when a newly designated Western Terminus was named in California at the Santa Monica Pier." We’d done it. Followed the old route from New Mexico to it’s terminus here on the shores of the Pacific Ocean. It felt momentous. 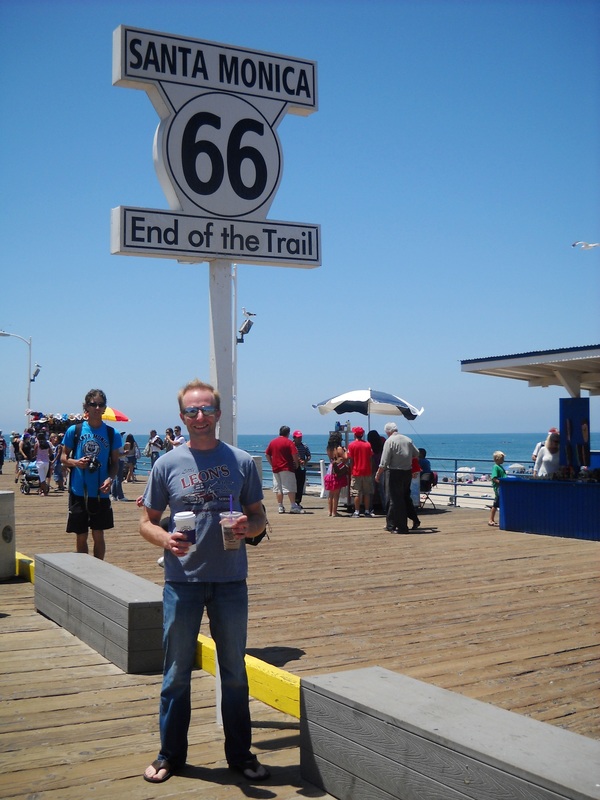 Our roadtrip now would lead us up the Pacific Coast, and excited as I was for the journey to continue, I was incredibly melancholy about leaving Route 66 behind. There is something about that road that I cannot put into words, but I would drive on her forever through time, if I could. After five days of heading West, for the first time we changed directions and angled our Tahoe north, up Highway 101. The dramatic Southern California Coast unrolled ahead of us as we made our way along the Pacific’s edge. 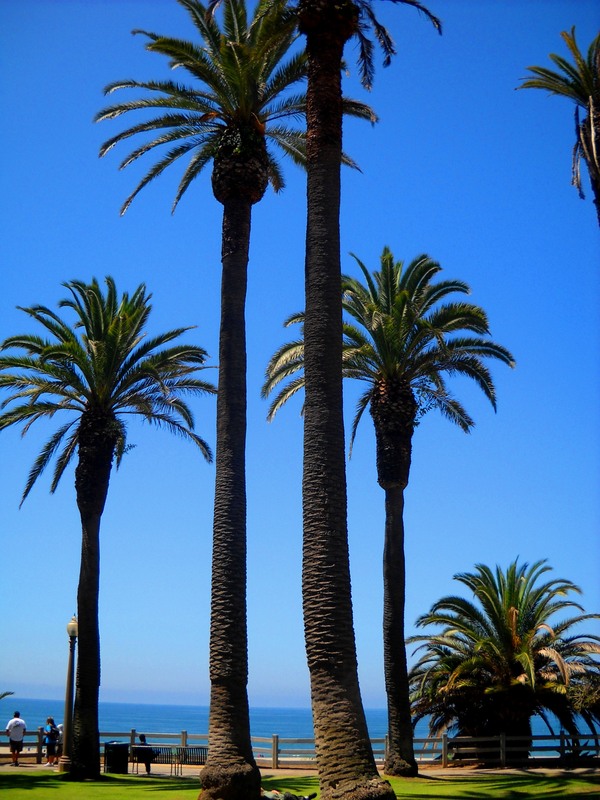 And everywhere the eye could see ~glorious palm trees. 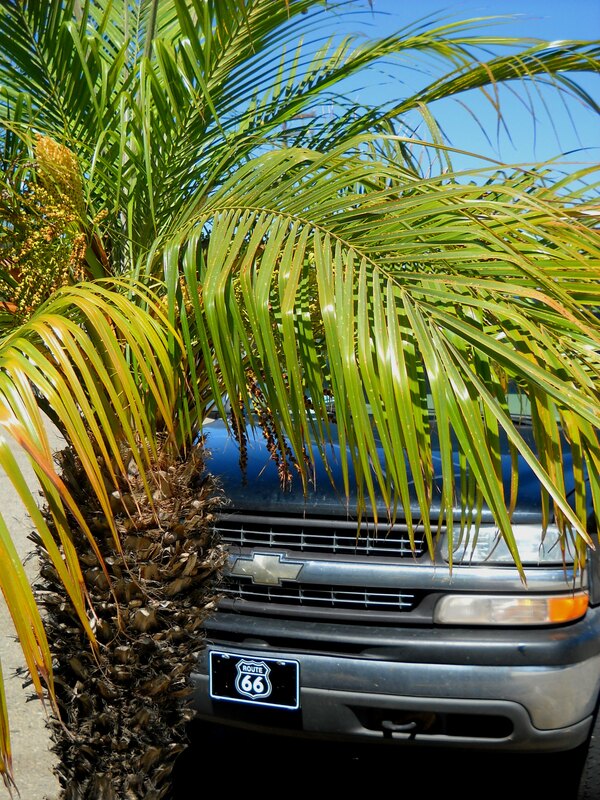 Our next stop, (for lunch, since breakfast somehow failed to happen) was in Pismo Beach, CA. We ate at Pierside Seafood in downtown Pismo Beach, with a fabulous ocean view and affordable fish~n~chips. We then walked around a bit; I had it in mind that I might like to find a coffee-to-go, when we came upon a candy shop that specialized in a rather unusual gourmet offering. Tequila Worm Suckers. Ants, Crickets, Scorpions, and Worms. Both chocolate-covered and plain. All available at the Hotlix Candy Store in Pismo Beach. 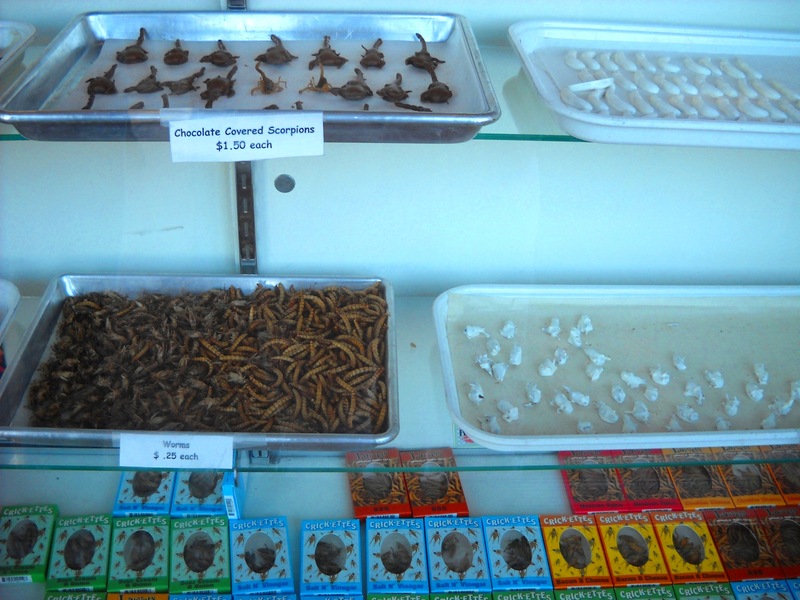 Not planning a trip to the California Coast soon enough to satisfy your sweet insect craving? Not to worry! They also run a booming on-line business -you can order your crispy dried earthworms, cinnamon encased tequila worm pop, or chocolaty coated crickets right NOW! Don’t delay, they’re probably better fresh. I wouldn’t know for sure, though, I couldn’t get my husband to try one, even though I double-dog-dared him. He proceeded to triple-dog-dare me to eat one, and I was so appalled at the very idea, that I dropped the conversation entirely. After repeated, dramatic, and exaggerated gagging gestures. Damn, he’s sneaky that way. Before continuing on, we walked around Pismo Beach near the pier. I had brought with us on this trip a box of gallon sized ziplock baggies and a black sharpie -for the purpose of collecting sand and shell samples as we worked our way up the coast. I wanted these samples to demonstrate to our children how the beach varies in different locations. Plus it’s really fun. 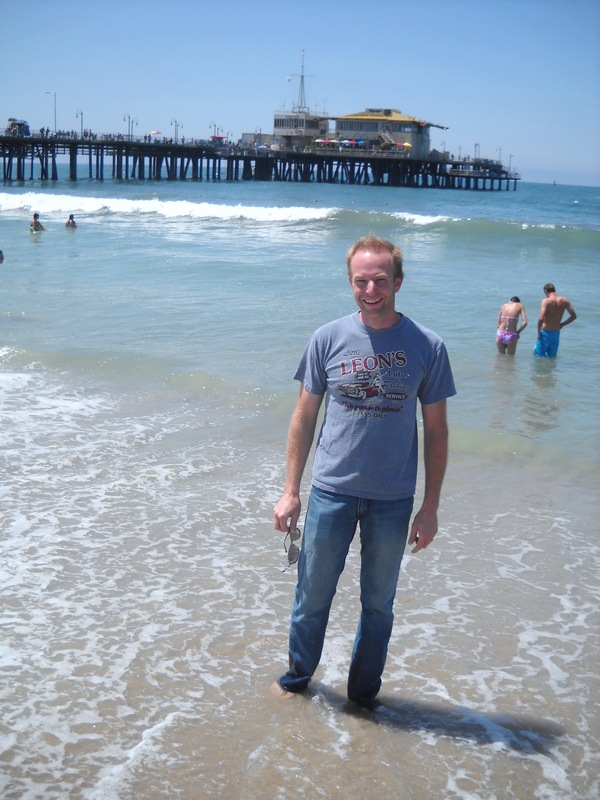 The sample from this location -labeled 7/29/10 -Pismo Beach- Southern California Coast consists of pure, soft, very fine, light-tan sand and minimal, tiny shell fragments, as these were very scarce at this particular beach. Scientific sample secured and labeled, we continued north up Highway 101. Around eight-o-clock in the evening, we arrived in San Luis Obispo, CA. 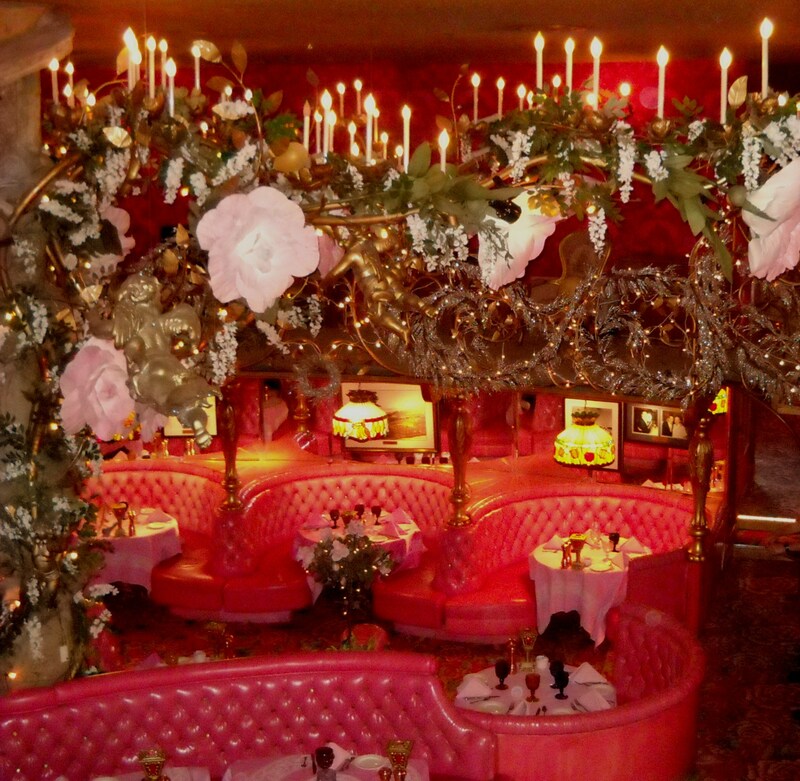 Home to a Roadside America attraction I’d long wanted to visit – Madonna Inn, a hotel that continues to amaze with its devotion to excess. A unique resort hotel in San Luis Obispo, the public bathrooms alone are worth the stop. 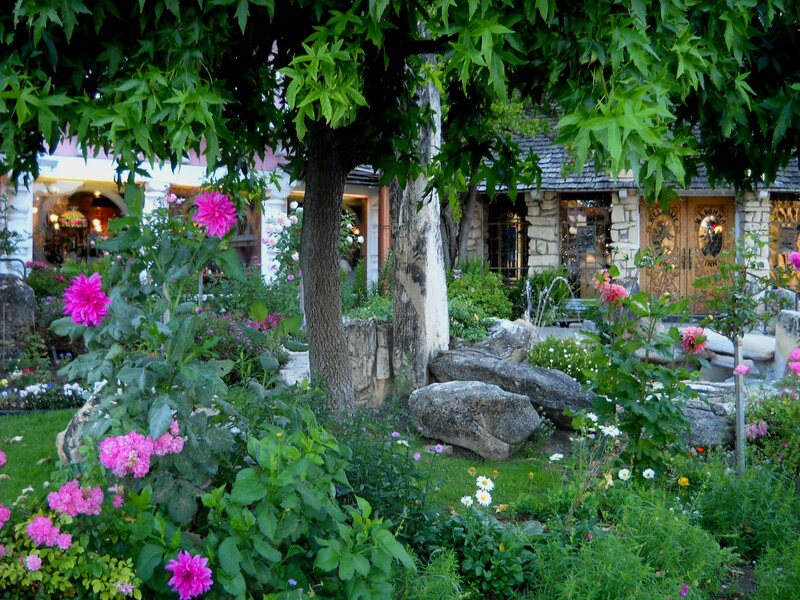 The Madonna Inn has 110 outlandishly lavish “themed” rooms (Caveman, Canary Cottage, Sweepstakes, Antique Car, etc), European gardens, and an overall pink vibe that is charming. Alex & Phyllis Madonna created the Inn, and apparently Mrs. Madonna took over the decor. 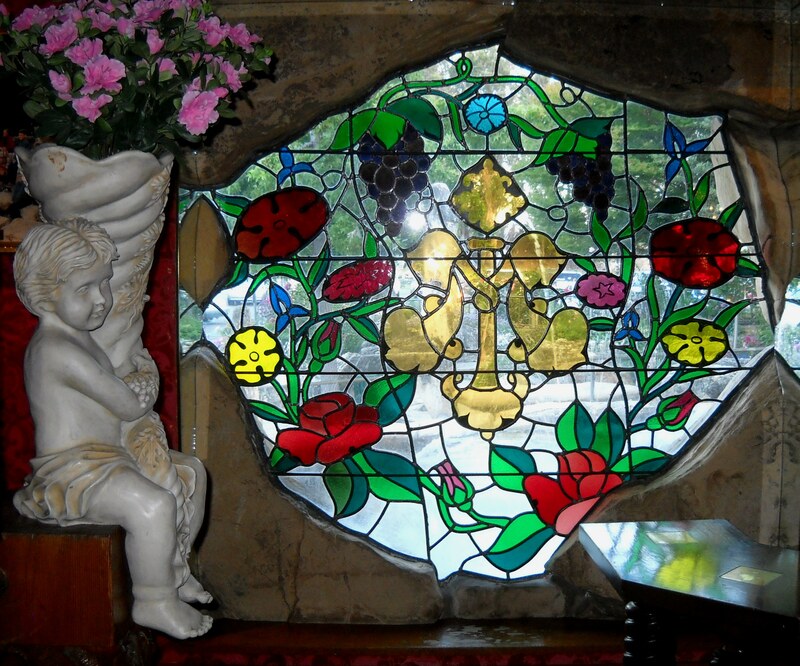 She designed the ladies’ public restroom like an extravagant palace. 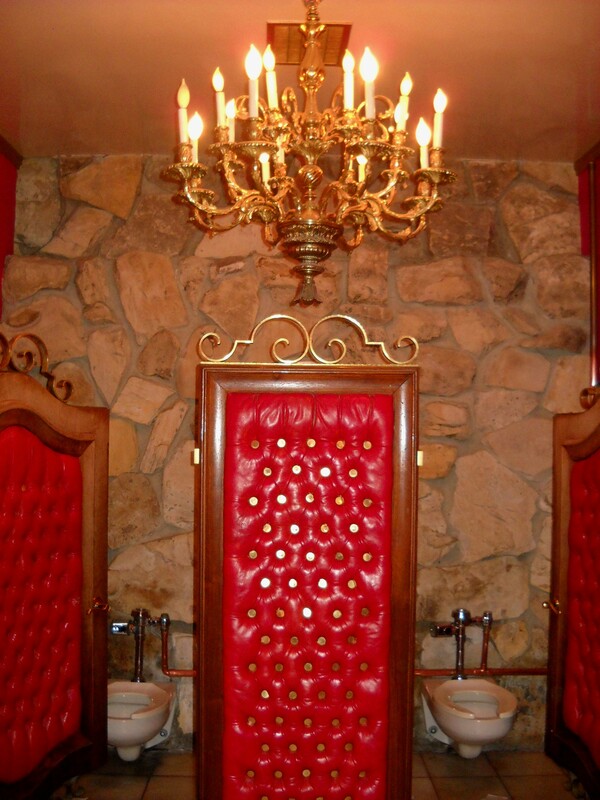 Mr. Madonna apparently felt it was time the men around there had a say, and he one-upped her by designing a public mens’ room equally lavish, but with a unique addition. 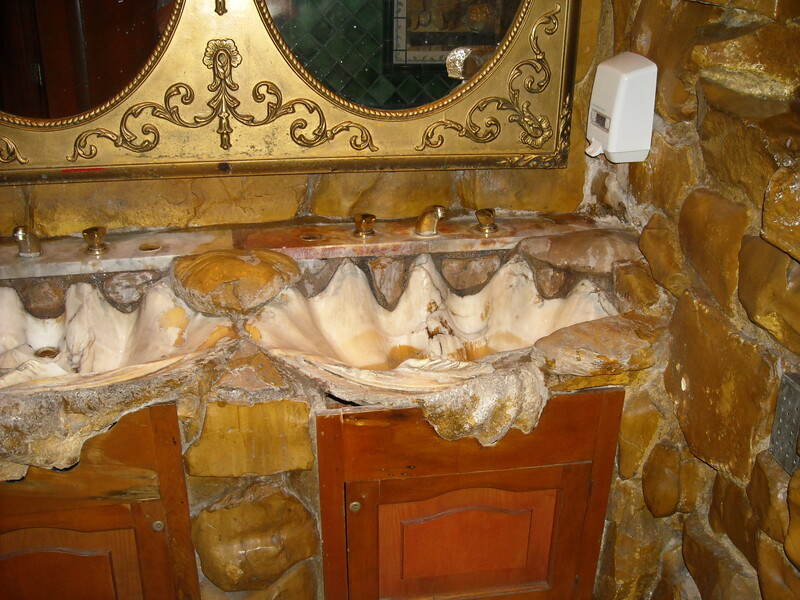 The urinal appears to be just a rock wall over a marbled floor. Once a man begins peeing, though, his “stream” activates a laser that starts a waterfall cascading down the rocks…. From San Luis Obispo, we had access to old Pacific Highway 1, and proceeded north, hugging the coastline. We were still a good 80 miles from Big Sur, when it became fully dark and the fog rolled in, making the hairline curves less than entertaining. It was time to stop for the night, but here along this rugged, highcliff coastline, civilization was scarce. A coastal lodge appeared on the winding road ahead, and we stopped to use the facilities. Several cars were parked in the pullouts around the lodge, filling up all available wide spots in the road, but only a few were in the actual parking lot. The convenience store attendant, who was closing up for the night, informed us that the reason for this was California law that allowed overnight parking anywhere alongside the road that is wide enough to accomodate a vehicle, but not in parking lots. The lot here was reserved exclusively for lodge guests. However, armed with this new knowledge of quaint Califonia legal strictures, we drove on with an eye out for our own wide spot in the road. We passed a few, since you tended to spot them after it was too late to veer in, but eventually found a comfortably large pullout that would accomodate the tahoe’s girth, and pulled in for the night. The tahoe was pointed north in the pullout: to our left, the highway and a fairly sheer drop to the ocean below on the other side of it, to our right, an ascending hill. Ergo, nowhere really to wander as far as locating a secluded spot. However, it was late, and dark, and we appeared to have Highway 1 all to ourselves for the moment, so I wasn’t too worried about proximity to the road of the small bush I’d chosen to serve as an outdoor lavatory. I was, however, worried, when the sound of something sizeable seemed to be hurtling down the hill toward me. I sprinted back to the tahoe and leapt through the open door, swiveling immediately to direct my flashlight up the hill. I saw nothing, because man-bear-pig is canny, and hides from the light. My husband, who had never so much as paused from brushing his teeth beside the tahoe while I bounded past him, informed me that it was not, in fact, man-bear-pig, or even my second guess, some massive form of sharp-toothed woodchuck found only in California. He proposed that a very, very small creature -perhaps a field mouse- may have dislodged a stone from its path, and I probably heard this pebble roll down toward me. As we snuggled in to the mattress in the back, our laughter and blather gave way to somnolent whispers, and soon succumbed altogether. It was then, parked directly above an ocean precipice, that the distant sound of the tidal waves below rose to meet us. We listened to the ocean chatter, soon joined by the barking sea lions below, and their crotchety conversation lulled us to sleep.